We are always being told to eat more whole grains. But what does that mean, and more important, how can we do it with our already busy schedules? There are two main health reasons for switching to whole grains: They contain more fiber, and have a lower glycemic load. Fiber is an indigestible carbohydrate that helps your system work better. The glycemic index is a way of rating foods by how quickly your body converts the carbohydrates into glucose, or sugar. If you’re diabetic you already aware of how whole grains and high-fiber foods like nuts and legumes keep your blood sugar low. Eating foods with a high glycemic load, like white bread or white rice, puts you at higher risk for Type II diabetes, gall bladder disease, and possibly cancer. Whole grains can help you keep your weight down, since they fill you up faster but with fewer calories. And they are less processed, so they contain more vitamins, too. Examples of healthy whole grains include brown rice, whole wheat flour, wheat nuts, barley, bulgur wheat, whole oats, buckwheat, rye, and spelt. You can also get unrefined flours made from these grains. There are many types that are in-between—whole-wheat flour with part of the fiber removed, instant oats, bulgur, partially cooked brown rice. Even though they are partially processed, the are all better than white flour. Taste and texture. Whole grains have a nutty flavor and take longer to chew. (The flip side of this is that foods made of refined white flour are often pasty and tasteless.) It can take getting used to. 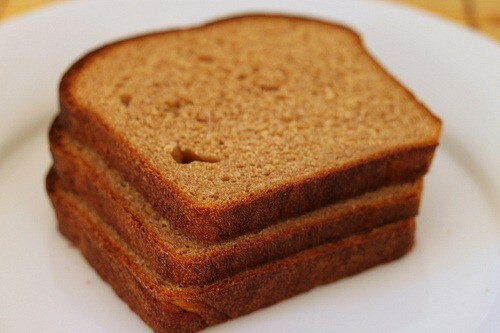 Try to mix brown and white rice or flour at first, or offer a sandwich of one slice of white bread and one whole grain. Cooking times. Whole grains do take longer to cook.Brown rice takes 30 minutes, white only seventeen. You can start with partially processed grain types like bulgur wheat or instant oats that only need soaking. You can also cook them in advance or in bulk—I try to keep extra brown rice for adding to patties or an omelet. Or add the grains to a soup or stew that has to cook for a while anyway. Use a pressure cooker to cut cooking times, or start the grains in a crockpot before you leave for work. Restaurants, parties, and processed foods. For me, the biggest challenge to good eating habits is outside temptations. Pizza, hamburger buns and cakes are rarely whole grain. Cook at home as much as you can and offer to bring a dish when invited out. And read ingredients carefully. Many breads, crackers and cereals marketed as healthy do not contain whole grain. Baking. Baking also takes a new set of skills, and separate equipment. Yet if you buy most of your bread, you’re either paying a lot or you’re not getting much whole (or both!) You can start by making pancakes or simple pie crusts, then work your way into muffins and breads. Storage. Whole grains and flours should be stored in the refrigerator or freezer, as they contain natural oils that can get rancid. This helps keep them free of insects, too. Expense. Sometimes whole grains or whole grain products are sold as specialty items, even though they are less processed and should be cheaper. Look for stores that sell in bulk and have a high turnover (for freshness), as these usually offer better prices. Or consider joining a food coop in your community. Every improvement toward healthy cooking style requires learning curve for both the cook and the “guinea pigs.” What challenges have you found when cooking or baking with whole grains? We’ve been adding more and more whole grains to our shopping list and menu, and I find your post very timely. I tried cooking amaranth a few weeks ago and no matter how look I cooked it (in broth on the stovetop) I couldn’t get it to soften up, and it ended up tasting like broth-flavored sand. Any suggestions? It is cold, cold, cold in the Mid-Atlantic, so I pulled leftover Brisket out of my freezer (from Rosh Hashanah) as we like to eat it as “soup” over egg noodles. I decided to give whole wheat egg noodles a try (we actually had them before – we just don’t eat them often) & they got a loud thumbs down from the toddler – who other wise was rather happy – especially with the gezer. Lots of sound ideas here. Convenience is another issue. In Israel, white pita is SO cheap and easy to find, as are many fresh rolls and other bread products. I only can find good whole wheat pita on Friday. (I stock up and make pita chips when it gets stale.) Much of the “whole wheat” bread, is not really all whole wheat, and it often has more preservatives because it is not baked locally. Obviously, the best solution is to bake your own bread, but it is time consuming, and sometimes the kids just don’t like it. And price…white pasta goes on sale all the time, whole grain pasta is often 3-4 times the price, and it doesn’t have that indulgent goodness of smooth white semolina. I usually like to use whole grains, but lately I’ve been slacking off. You’ve inspired me to get back to it! I love whole wheat flour, and whole wheat bread is so much yummier to me. Whole wheat pasta is a taste that I have yet to acquire, but I will try. What’s your opinion on white whole wheat? I’ve used it for challah sometimes, and have been pleased with the results. Thanks, Rivki! I don’t use whole wheat pasta, unless I make it myself. Pasta is made of durum wheat, and is healthier than standard white flour. Whole-wheat pasta can be good, or not so good. I find Barilla, an Italian brand commonly found in US supermarkets, to make consistently good whole-wheat pasta. I do not know if it is available in Israel. Another way to eat whole grains, by the way, is to soak a mixture of rice, oats, wheat berries, almonds, etc. overnight and eat in the morning as cereal with milk or sugar or jam or dried fruit or whatnot. Claudia Roden has a good recipe for this in her “New Book of Middle Eastern Food”. I have quinoa in the house, but I burned it last time I made it. I’ll have to try again. Actually, quinoa is a grass and not a grain. …and oh yeah, grits. I could not survive without grits in the morning. Whole-grain hominy grits are really, really good.